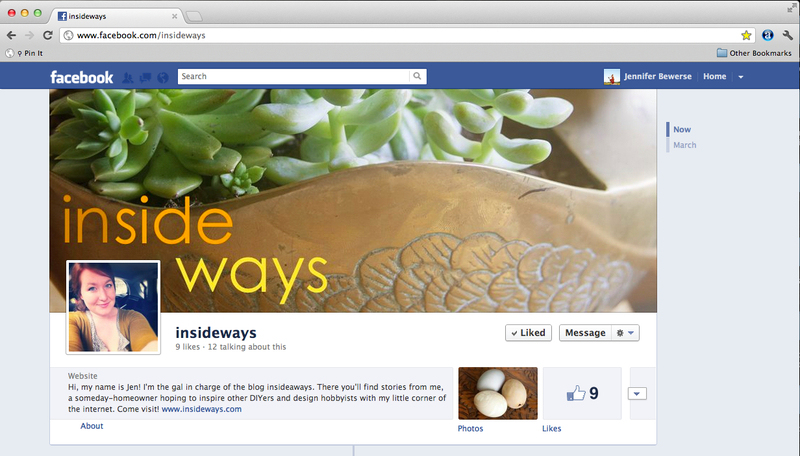 insideways is now on Facebook! I was nervous about adding insidways to Facebook for a long time (I don't really know why), but I finally decided to just do it! I'll be posting links to all insideways posts, but I'm also excited to start sharing in progress photos and status updates. I'm also thinking this will be a nice place to share links to other or interesting blog posts I see. It would make me feel very very special if you wanted to hop on over to Facebook and like the insideways page. Be my Facebook friend? Much to my surprise and honor, Georgia from More Like Home gave me the Liebster Blog award last week! What a crazy huge sweetheart right? Thank you Georgia!! Now I have to admit two things 1) I think I'm technically not qualified for this award - oh well too late now :) and 2) I actually got this award once before and didn't do anything with it. I'll admit, sometimes I feel really intimidated by these things, oops. 1.) Thank your Liebster Blog Award presenter on your blog. 2.) Link back to the blogger who presented the award to you. 3.) Copy and paste the blog award on your blog. 4.) Present the Liebster Blog Award to 5 blogs of 200 followers or less who you feel deserves it. 5.) Let them know they have been chosen by leaving a comment on their blog. So here's the thing, I don't really know who has how many followers yada yada, but I wanted to share 3 amazing blogs with you that might be under your radar. So apparently I'm thoroughly breaking rule 4. Another oops. writes the super sweetest blog ever. Don't forget to enter the Bella Pop Photography giveaway here on insideways. You have until Friday, but don't wait!